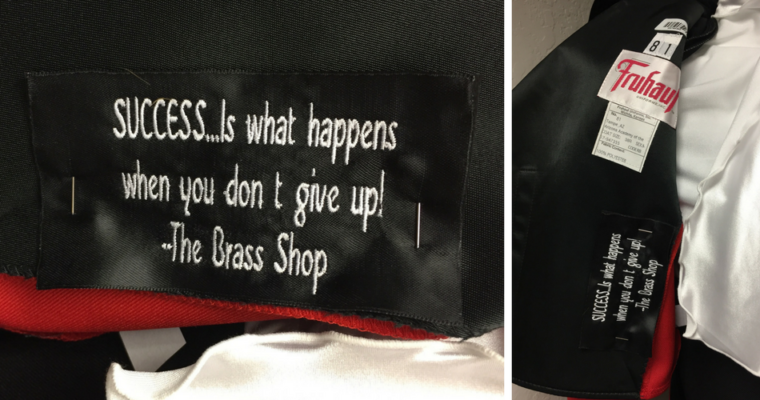 Get an inspirational message embroidered in a member uniform. One of the most special traditions for a drum corps member is putting on the uniform for the first time; it’s that “wow” moment they all look forward to. In this annual ritual, members learn what it means to wear The Academy uniform, and the powerful impression it makes on our corps and the audience. You can be part of this tradition with a Words of Wisdom message. For a gift of $100, your name and a short inspirational message of your choice will be embroidered inside one of our 2019 uniforms. You can designate your message to a specific member or section or let us choose for you. Your member will see your Words of Wisdom every time they get ready for a performance, and your gift will make a big difference in meeting the increased financial demands of our ambitious program. Our goal is to have Words of Wisdom in all 154 uniforms. I hope you will join in this new tradition.